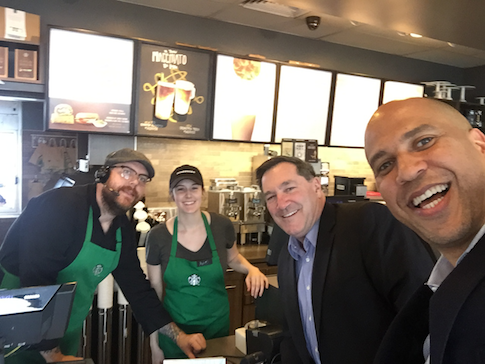 Indiana Sen. Joe Donnelly (D.), on the airwaves this week boasting of his support for funding a border wall with Mexico, received a helping hand from his New Jersey colleague Cory Booker, who was caught earlier this month calling for the elimination of all walls. Donnelly is considered one of the most vulnerable incumbents in the country given the overwhelming support for Republicans in Indiana, a state President Donald Trump carried by nearly 20 percent. Donnelly is running as a Democrat willing to work with Trump, bragging in his latest ad that he's willing to "break with his own party" to protect the border. "I voted for and supported President Trump's immigration bill, including the funding for the border wall," Donnelly says in his campaign's latest ad, which describes him as "tough on immigration" and "always strong on protecting America." The ad, "Borders," was released on Tuesday, one day before Booker sent out a fundraising email on behalf of Donnelly. Booker describes Donnelly as his "friend from Indiana," and praises his stance on the issues of health care and taxes. Booker, who has been clear on his opposition to a wall on the United States-Mexico border and last week was caught holding an "all the walls have got to go" sign, unsurprisingly made no mention of Donnelly's immigration stance in his fundraising plea. 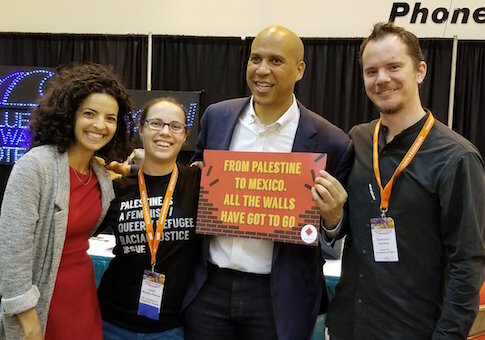 Booker eventually apologized for appearing with the sign, which was given to him by a radical anti-Israel group which advocates for the removal of Israeli security barriers used to protect its citizens from terrorist attacks. Booker's office said the senator didn't realize the sign had anything to do with Israel, and thought it was only attacking the idea of walls in Mexico. Booker called the idea of funding a wall "irresponsible," calling it "19th century technology." This entry was posted in Politics and tagged 2018 Election, Cory Booker, Joe Donnelly. Bookmark the permalink.